The Midwest Clinic - The Electric Orchestra: Plug In and Go improvise! The Electric Orchestra: Plug In and Go improvise! Clinic Synopsis: Electric strings are everywhere! For those who are unfamiliar, the process of going electric can be daunting. We'll discuss how to choose the best electric instruments for your budget, and how to integrate them into your ensemble. Mark Wood will be sharing his unique concepts using technology for electric instruments, learning, recruitment and retention. 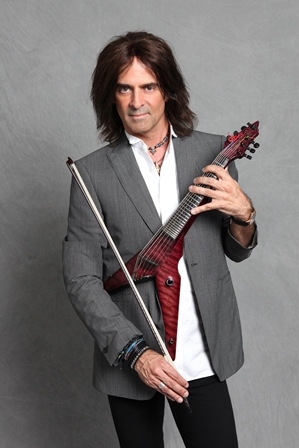 The Mark Wood Curriculum will demonstrate improvisation made easy, and integrating the ipad and iphone in at home practicing. Clinician Biographical Information A successful solo artist and published author, Wood’s absolute passion is music education. His innovative program Electrify Your Strings (EYS) - now in its 11th year - is an intensive rock and roll workshop for school music education departments that boosts student self-esteem and motivation and helps raise money for music education.Today EYS	visits upwards of 60	schools per year	and there	is a waiting list of schools	wanting to	participate. The organization has	been	featured on The	Today Show and	CBS	Evening News	and in countless	local media outlets. But for Wood, it’s all about	the kids. He’s dedicated to providing educators with the opportunity to ignite	their	students’ passions and	to inspiring students	to open their minds and unlock their potential.